Home » SHOP » FRANKY, HOW POWERFUL HE HAVE AFTER THE TIMESKIP? FRANKY, HOW POWERFUL HE HAVE AFTER THE TIMESKIP? This post is dedicated to our favorite One Piece Cyborg, Franky(pun intended :P). All the Straw Hats returned from the timeskip with interesting new abilities and Franky is no exception. The important question is, just how more powerful has he become after the time skip? But first, lets recap some of the most important parts of his past. 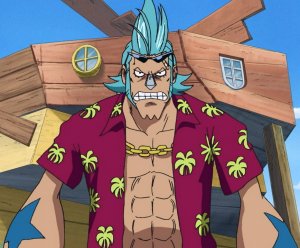 When the Straw Hats met Franky, he was leading an organization of ship dismantlers, named the Franky Family(after their leader of course :P). 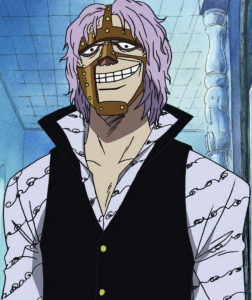 Iron Man Franky(that’s what Ceaser called him) comes from the poor South Blue, but the Straw Hats met him at Water 7. His real name is Cutty Flam, but he was forced to conceal his true identity by Iceburg. Remember Iceburg? He was the president of the Galley-La company, the mayor of Water 7 and a fellow apprentice of Tom. That’s why Franky chose to go with his nickname. Franky’s parents were pirates and they threw him out of their ship and into the ocean when he was little. Tom was the man who rescued him and took him in as his apprentice. Tom was the legendary shipwright who built Gol D Roger’s ship, the Oro Jackson. For that feat, Tom became a criminal due to his affiliation with the Pirate King. Tom was the man who taught Franky how to build ships. 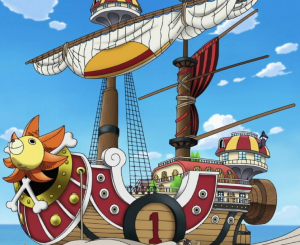 When Franky was young, he spent his time building warships able to defeat the Sea Kings. That’s when his aspiration began, to build his dream ship and also sail as a member of its crew. Tom decided to build the train Puffing Tom for the World Government, in order to be pardoned for his affiliation with Roger. He was able to accomplish the feat, but he was framed by Spandam. Spandam attacked Water 7 with the Battle Frankys and made it seem like Tom did, when he and his workers where protecting the city. Tom was sentenced to death. Franky tried to stop the Puffing Tom that was transporting him, which resulted in him getting badly injured and being perceived to be dead. He was actually on the verge of death. 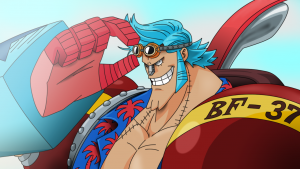 However, he was ultimately able to survive by “fixing” himself with parts from an abandoned ship, becoming himself the 36th Battle Franky. That’s where the BF36 tattoo comes from. After four years he went back to see Iceburg, and was amazed that he allied himself with the World Government. However, Iceburg gave Franky the blueprints for Pluton, the legendary Ancient Weapon. Those exact blueprints were passed down to Tom from the Water 7 shipwrights. Iceburg wanted to make sure that the blueprints wouldn’t fall on the hands of the World Government, that’s why he gave them to Franky. Franky couldn’t forgive himself for what happened to Tom. He wanted to atone by controlling the crime scene of Water 7. So, he decided to become the leader of the Water 7 underworld! He had his immoral moments, but his unltimate purpocs was to protect Water 7, the city Tom adored and did everything to protect. Franky along with his followers, the Franky Family were enemies of the Straw Hats to start with. They were forced to collaborate though, due to having common enemies. The Franky Family wanted Franky to join the Straw Hat crew, when he was rejecting the idea, because they wanted to see him pursue and fulfill his dream. What dream? But of course building the Thousand Sunny and navigating the seas with it. How powerful is Franky post timeskip? Franky spent the timeskip studying Vegapunk’s blueprints, in order to reconfigure his body and add new functions to it. He can even change his hairstyle now, by pushing his nose for some seconds :D. Some stiches that have appeared on his body, indicate that he probably sew his skin back on. In general, it seems his whole body underneath is robotic, with many different tools and weapons available. However, it seems that he has tried a lot to make the body’s appearance seem somewhat human. The skin, the hair on his robotic arms and eyes that resemble real ones hover above his robotic lenses. His tattoo has also changed, now being BF37, introducing himself as the new Battle Franky 37. Franky is a highly talented shipwright. On top of that, he seems to be competent at surgery, as he essentialy saved himself by operating on his body, while on the verge of death. His abilities don’t stop at ship building and engineering. 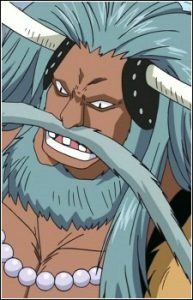 He’s a really strong member of the Straw Hats, with exceptional physical strength. Now, with his newly modified robotic body and the weapons he can wield, his abilities have certainly sky rocketed. He now has more cola available in his body, which lets him last longer in fights. 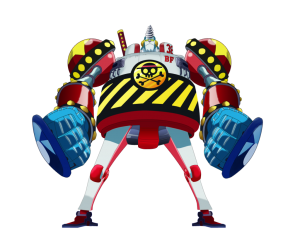 During the time skip, he even went on to build the Battle Franky 38, the Franky Shogun. It is an enormous robot he can operate, a one-man weapon/vehicle in essence. I will end this with some crazy theories regarding Franky. Remember Avalo Pizzaro, the member of Blackbeard’screw? The man seems like a cyborg due to his weird hands. As a result, many have speculated that he may be related to Franky. Maybe his father or something, who knows. I highly doubt it though. The other theory that i found interesting is related to Jewelry Bonney. The real life pirates Bonney and Calico, had a son who they abandoned when he was young. Also, Bonney has the age altering fruit of hers, so she could be really old. As well as that, there was an old crew member of Brook called Calico. What if they were Franky’s parents and abandoned him? What do you guys think about One Piece Cyborg Franky? How much stronger do you think he is after the time skip? Share your thoughts in the comments please. Previous: WHICH STRAW HAT CREW MEMBER WILL DIE?